No matter how many degrees McDonald’s rotates its sign, America doesn’t exactly look like a feminist utopia right now. But if you're considering a graceful exit from these United States in light of that, don't just throw a dart at a map. There's data on this and a whole list of places where life is reportedly pretty great. US News & World Report just released its 2018 ranking of the best countries for women to live, and the US didn't do terribly well. Not only did we not make the top 10 -- we were relegated to No.16. 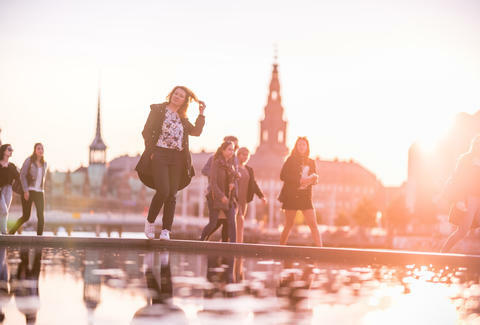 The publication surveyed over 9,000 women to determine the 80 best countries for women to live in as part of its overall Best Countries ranking. These rankings are based on five categories: human rights, gender equality, income equality, progress, and safety. Denmark replaced Sweden in the top spot this year. Denmark is also the No. 1 country to raise kids in, with flexible parental leave and an earnings-related daycare system, and it's No. 11 in the overall rankings. And there's a delightful cycling culture in Copenhagen, which isn't exactly related but makes the country seem like even more of a utopia. Notably, four of the top five best countries to live in as a woman are Nordic countries. Canada came in sixth place, plus No. 2 for countries overall. This, along with its proximity to the US, makes taking a lifelong trip up north sound more appealing than ever. While Canada and all those Nordic countries sound like calm, sensible places to live, some folks prefer adventure along with their income equality. If that's you, you'll be relieved to know that both Australia and New Zealand came in at No. 8 and No. 9, respectively. As for that No. 16 slot, our ranking means we certainly have something to work toward.